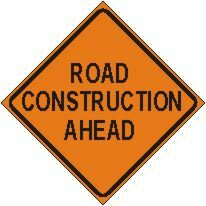 Road Construction Ahead | Alpine Products, Inc. Available in a variety of materials and sizes, roll-up signs offer full size signage in a lightweight and easy to store design. – Fiberglass ribs, or cross bracing, feature a protective veil to prevent blooming and painful splinters.